Building & Monument Identity Signs; ADA (Braille) Signs; Plaques, Nameplates & Workstation Signs; Fire, Code, Life Safety & Evacuation Signs; Flat Cut Out & Fabricated Dimensional Letters & Logos; Directories, Kiosks & Cabinets; Hand Painted & Wide Format Digital Environmental Graphics; Donor Recognition Walls & Displays; Custom Awards & Gifts; Menu Boards; Memorial & Dedication Plaques; and other Custom Fabricated Architectural & Graphic Elements. Neiman & Company is very proud that the majority of our product is fabricated by our in-house craftsmen – most of whom have been part of the team for well over a decade. 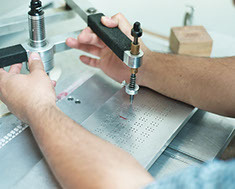 In house processes run the full gamut and include screen printing, digital graphics, cnc router, laser etching, fabrication, digital 3D printing (tactile letters & Braille) & special finishing. Our talented crew applies their skills to an enormous variety of materials including aluminum, stainless steel, acrylic, wood, glass, photopolymer, zinc, copper, brass & bronze. They are accomplished in impeccably applying a full range of finishes to satisfy the most exacting clients, including skilled paint application, blast resist, faux finishes, polished & beveled finishes, etched & filled graphics, patina & oxidized finishes, brushed & random brushed finishes. It is our practice to train, develop & promote from within, and by doing so, we are assured of our team’s commitment to the highest level of quality and service for which we are known. Considered the hub of our organization, our Project Management team is responsible for each & every project, from layouts to closeouts. Our Project Managers interact directly and closely with our clients, our clients’ designers, our in-house production team, regulatory agencies, construction managers, and anyone else necessary to get the job done. They have significant hands on experience, and are highly versed in the various materials & processes incorporated into our signage. It is their expertise, professionalism and commitment to finishing projects on time, to spec, and within budget which allows us to build upon our longstanding reputation as leaders in the fabrication & installation of quality architectural signage industry. As a full-service architectural sign company, Neiman is able to fabricate and manage all aspects of the largest, or the smallest, of projects. We offer guidance in Pre-Construction Budgeting, ADA Compliance, and Value Engineering. Though typically we fabricate new product, we also offer Removal, Restoration & Relocation services. We frequently work in a Design-Build or Design Assist capacity. We also offer Permit Acquisition, Rebrand Rollout Assist & Licensed Installation services. Our cost effective FastTrack™ ReOrder Service extends our commitment to service and quality. Neiman attributes its success to our commitment to service and quality, which extends to our FastTrack™ system. While many companies impose exhorbitant minimum order sizes and lengthy lead times on re-orders, Neiman & Company offers our FastTrack™ service. By maintaining an inventory of partially processed custom sign components, it is our goal is to provide clients with re-ordered signs within no more than 14 calendar days of receipt of an order and approved layouts. 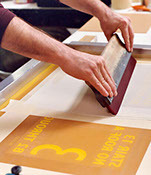 While large orders, as well as large signs, are not well-suited to our FastTrack™ service, we also maintain permanent records of manufacturing techniques, production flows, custom paint and ink colors, and art layouts to shorten typical lead times to 3-4 weeks from receipt of these types of re-orders.